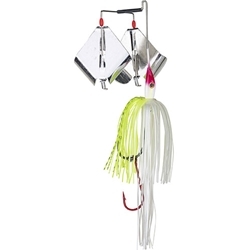 The Double Take double bladed buzz bait is unique in several ways. The two blades provide a lot of lift so the bait comes up quickly when the retrieve starts and can by retrieved very slowly. The blades spin in opposite directions and spray water outward in a wide path which causes a commotion unlike any there buzz baits. Their counter rotation also causes the bait to track in a perfect straight line. The exciting Perfect Skirt blooms wide even and the exclusive Magic Tails serve as a trailer and together they give more action than typical skirts, the color patterns match the head of the lure and create an appending and natural look to the fish. The bait is also pre-rigged with a Sabre Point trailer hook! Check your heart and get ready for some exciting surface action!